Is my starter okay? It turned into a purple alien landscape. I've used my starter for about a year, and unexpectedly found it looking very unusual today after a few weeks of neglect. Does anyone know what this is? Is it garbage? YIKES! This is a case for Debra Wink. Hope you're wearing a hazmat suit. This is one for our resident microbiologist Debra Wink. Think you should message her. Is there any part of the starter that looks healthy? If so then you can carefully remove the top and then with a clean spoon take from the healthy looking starter that hasn't been in contact with the aliens. Then, in a new sterilised jar, feed it pineapple juice and fresh flour. See what it does. If it responds well then carry on as normal with water. I think someone had this issue before and Debra came to the conclusion it is oxygen starved yeasts. :). Is it rye? What was the water source? Very interesting microbiology article from the cheese industry. I recommend that you carefully dispose of it, either by sealing the jar and disposing of it or carefully dumping down the toilet (without splashing) and sanitizing yourself and the jar,sink,toilet and whatever. I haven't poked around to see what's underneath. It's normal plain flour. Are you near any universities? that’s one heck of an interesting structure that the organisms have created. Thanks for sharing the picture. ...that the purple could come from a nasty bacterium responsible for numerous hospital-sourced infections, is enough to make me think "ditch the whole thing without trying to save any part of it". Until (if) someone can show that this purple is definitely not dangerous - and can convincingly show why - then I'd be nervous to even touch it. To answer your questions. No! To answer your questions. No! I do not know what it is. Yes! It is garbage. And furthermore the container is garbage, too if you don't have the ability to expose it to a temperature roughly equivalent to the surface of the sun for a significant amount of time. It's easy enough to replace it with a safe, vibrant starter. Probably just nutrient starved yeast. ... when it's food-related and the "unknown" is disgusting and an unexpected weird colour. Disgust is one of the mechanisms that keeps us alive. ... I dunno about "right"! ... that the purple goo is safe, the appropriate response is to reject it and throw it away. There's no good reason to assume it's safe, until someone can show why it is. Getting over the fear, without evidence, would be an inappropriate and foolhardy response. ... the comfort of knowing something is right?! Truth is aceptance. If no one ever went out on a limb the human race would have died out long ago. , to me, proof would be someone saying "Yes I've seen exactly this before, and it's been positively identified as [name], which is safe to eat." If we lived 1,000 years ago, you and I would be looking at each other saying "You try it." "No, YOU try it!". But in modern society, with ID catalogues online and instant communication with experts, and with making a new starter such a well-known and easy process, there's no reasonable justification for taking the silly risk. Nice analogy, however you don't eat your starter as is, do you, or do you?? So where is the risk? If a mix of flour and water that is fed and shows repeated leavening capacity, then it is what it is... A sourdough starter. But definitely don't eat it. Some of those folks that 'went out on a limb' literally went OUT (think rustlers apprehended by vigilantes). Those that stayed a little closer to the trunk and merely observed the consequences instead of experiencing them lived long enough to pass on the knowledge they acquired by observation - don't steal another man's cattle. In the end proof and therefore truth is not acceptance; it is consequence. Actually, it isn't. Indeed, it has killed people in the past. But that is a side issue here. ... in fairly recent history, a movement (in North America at least) away from sourdough, perhaps in large part because it was perceived as "dirty" or "contaminated". They're not cleansed or neutralized. (Well, some may be neutralized if they find the acidic environment inhospitable, but there's no magic involved in that.) Occasionally, bad things can contaminate your sourdough. Occasionally, you may need to throw it away and start again. But because we now know how sourdough works, and don't need to worry that it will fail, it's just not a big deal to start again. and recognizing the pattern of the growth, I went to check on my starters last fed about a year ago. None of them were prepared for longtime stay at the back of the fridge. None of them looked like the photo either. I took out the Einkorn starter and peeled back the dark brown multi layered gel like surface skin which exposed a bright normal looking starter underneath. The top protective layer smelled sewer like awful but the starter underneath, once away from the jar seemed to be worth a try. (No, I did not taste it.) So it got fed and put into the bottom of a clean jar and marked and loosely covered 26°C. After about 8 hours, the surface had turned color to mottled black-brown. Interesting. I rolled the jar around to mix it up but the specks seemed to be floating little colonies and smell was enough to get me to flush it down the drain. Most likely a bacteria taking advantage of the situation. I ballanced 1) return this to normal or 2) start a new starter. Both might take the same amount of time and a new one has a better chance of having a greater selection of the bacteria and yeast colonies desired. Didn't like the rapid colour change no matter what it was and the odor stuck in my nose for hours. Starting a new one today. ... infected by something that's bad and that happens to thrive in the starter environment, then there's no such thing as being able return the starter to normal. That simply doesn't happen, most of the time - but clearly, this situation doesn't qualify as "most of the time". This looks much more like "rarely, something might go wrong" time. Nobody here recognizes it. Nobody here has had it before. I recognise it. I have seen this before! However, it was on a wine ferment and looked exactly like the OP's picture. I've also encountered this when I extracted yeast from my starter and made its new home a water-sugar only medium. After about a week it grew a wrinkled film that was very yeasty smelling! about a courtesy reminder. Do it now. Make a back-up starter when things are going good with the starter. It can speed up recovery when things go bad. Hey, I found a 10 yr old back up rye starter. Still looks good! In the freezer! Thank you, mwilson-I was looking for just this name. I couldn't remember and it is very hard to search "wavy mold on starter" or some such. I love Sandor! I have his book and ferment all kinds of things. 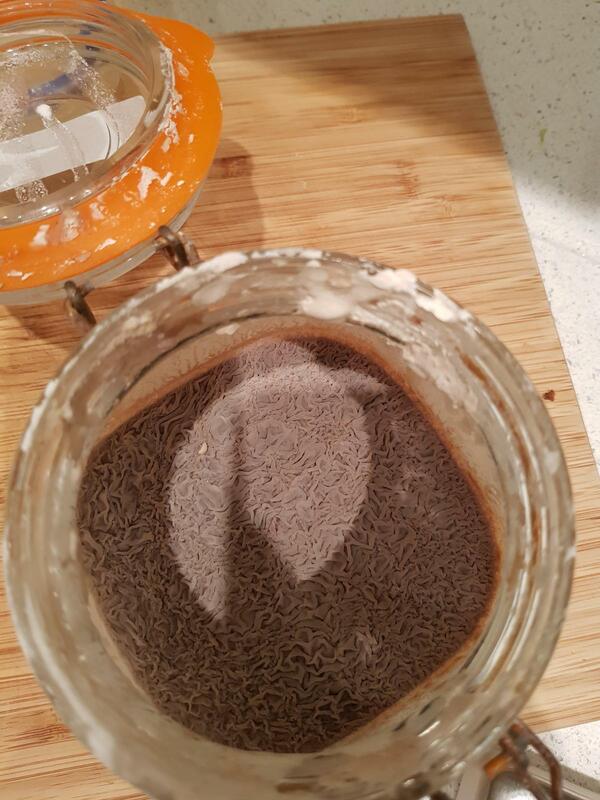 I've seen kahm yeast-it regularly inhabits my kefir and is actually very cheesy flavored (tart and delicious smeared on WW toast) and cream colored. What bothers me is the color of this particular culture. It might be some kahm but the purplish coloration makes me wonder if it is also growing proteus. Other brown,pnk or purple kahm pics are on items that generate that color such as red cabbage or beets.The original poster stated he was using regular flour and not WW (pinkish colored), buckwheat or other highly colored flour or liquid that would make the starter a funky color. Until I know what it is I still stand by my maxim--When in doubt, throw it out. I do wish Debra Wink or other microbiologist based folks would chime in. There must be a few cheesmakers here. ... doesn't necessarily grow on flour. Cheesemakers' opinions might just mislead us. I don't know. Notice that none of the experienced bread makers who have looked at this post are saying "Oh, I know what that is". None. That may just mean that the right person hasn't showed up yet, and I'd be very satisfied to be proved wrong. But I wouldn't be satisfied to be simply dismissed as being squeamish. Sandor is great! I have "The Art of Fermentation" and treasure it. First discovered the book at Preston vineyards in Dry Creek, Sonoma County, CA. The wrinkled film itself looks like it could be grey and perhaps the purple is coming through from underneath maybe? I would think that a certain bacterium is responsible for the colour. What bothers me is the dark colour. You can see here a similar photo but the underlying culture is also dark not white flour. I also see a cream color, crescent-shaped structure that in this context I would guess to be a macroconidium, but I'm not a mold expert. And several uniform tiny white specks that could be conidiophores developing.